The Israel-Palestine conflict is one of the world’s most polarizing confrontations. Its current phase, Israel’s “temporary” occupation of the West Bank, Gaza, and East Jerusalem, turned a half century old in June 2017. In these timely and provocative essays, Gershon Shafir asks three questions—What is the occupation, why has it lasted so long, and how has it transformed the Israeli-Palestinian conflict? His cogent answers illuminate how we got here, what here is, and where we are likely to go. 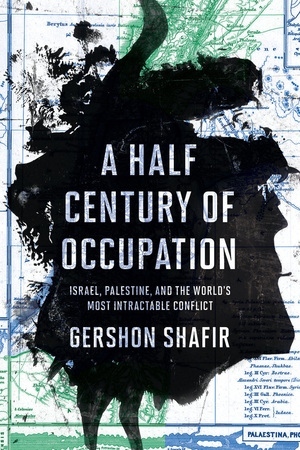 Shafir expertly demonstrates that at its fiftieth year, the occupation is riven with paradoxes, legal inconsistencies, and conflicting interests that weaken the occupiers’ hold and leave the occupation itself vulnerable to challenge. Gershon Shafir is Professor in the Department of Sociology at the University of California, San Diego, and the founding director of its Human Rights Program. He has served as President of the Association for Israel Studies and is the author or editor of ten books, among them Land, Labor, and the Origins of the Israeli-Palestinian Conflict, 1882–1914. He is also the coauthor, with Yoav Peled, of Being Israeli: The Dynamics of Multiple Citizenship, which won the Middle Eastern Studies Association’s Albert Hourani Award in 2002, and the coeditor, with Mark Levine, of Struggle and Survival in Palestine/Israel. 1. What Is the Occupation? 2. Why Has the Occupation Lasted This Long? 3. How Has the Occupation Transformed the Israeli-Palestinian Conflict?